Rwanda will delight and surprise you with its friendly people, remarkably pleasant capital Kigali, and stunning volcanic landscapes. Despite the terrors of its past, Rwanda is a remarkably vibrant and optimistic place to visit. Of course the main attraction is the rare mountain gorilla, Rwanda hosts around a third of the remaining population of these magnificent primates The excitement of tracking the mountain gorillas through the thick foliage, with the stunning Virunga volcanoes as backdrop, is an absolutely magical experience. But there’s more than just gorillas to discover, Rwanda sits at the hub of Africa. Here, at the center of the Albertine Rift, where deep volcanic forces are pressing the continental plates apart, you’ll discover a world of exquisite beauty and unsurpassed biodiversity. Rwanda is the bridge between the forest ecosystems of the Congo basin and the great rift valleys of the east. It shares in the biological riches of both worlds, offering a concentration of biodiversity found nowhere else in Africa. See for yourself why Rwanda can be called “the place where Africa comes together”. Location: Rwanda is in East/Central Africa, east of Democratic Republic of the Congo with Uganda to its north and Burundi to the south. 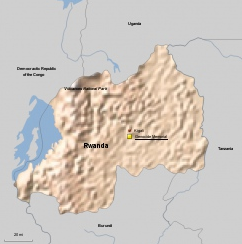 Rwanda also shares its eastern border with Tanzania. Size: Rwanda is one of the smallest countries in Africa, it covers 10,169 square miles, making it slightly smaller than Maryland, or Belgium. Population: Just under 12 million people live in Rwanda. Languages: Kinyarwanda is spoken by most Rwandans, as well as English, they are the two official languages of Rwanda. French is still widely spoken but is not an “official language”, and you may hear KiSwahili which is used as a lingua franca as well. The Flag: The present Rwandan flag was adopted after the 1994 genocide, to symbolize a “new start” for the country. The blue band represents happiness and peace, the yellow band symbolizes economic development, and the green band symbolizes the hope of prosperity. The sun represents enlightenment. Currency: The Rwandan Franc (RWF) is used in Rwanda, but most luxury lodges and upscale hotels will also accept the US Dollar. Getting to Rwanda: The main point of entry into Rwanda is the Kigali International Airport (KGL). There are no direct flights from the US to Kigali, but there are direct flights from Amsterdam (on KLM), Brussels (Brussels Airline), Addis Ababa (Ethiopian Airlines) … You can fly to Rwanda on shared charter flights from the Serengeti, Arusha, Nairobi, Entebbe and Johannesburg. Land border crossing with Uganda is possible to combine gorilla trekking there. Located at Rwanda’s geographical heart, the rapidly growing city of Kigali is not only the national capital, but also the country’s most important business centre and main port of entry. Serviced by an efficient international airport and connected to neighbouring Uganda, Tanzania and Burundi by surfaced roads, Kigali boasts a range of hotels catering to all tastes and budgets, and an assortment of fine restaurants whose menus reflect the country’s historical links with Belgium – while also embracing numerous other international cuisines. Despite such concessions to modernity, Kigali retains the feel of a garden city, with a satisfyingly organic shape dictated by the verdant slopes over which it sprawls. The compact, low-rise city centre surrounds a busy, colourful market, and is studded with souvenir stalls displaying a wide range of lovingly executed local crafts. The atmospheric Muslim quarter abutting the city centre is well worth a visit, and one can also explore the network of leafy avenues that wind out of the town centre into the surrounding residential suburbs. Among the safest and friendliest of African capitals, Kigali is blessed with a moderate high altitude climate that belies its tropical location, and is conveniently located within three hours’ drive of the main tourist sites. The Rwandan capital provides both a comfortable and welcoming introduction to this land of a thousand hills and an ideal springboard from which to explore this magical country. “In the heart of Central Africa, so high up that you shiver more than you sweat,” wrote the eminent primatologist Dian Fossey, “are great, old volcanoes towering up almost 15,000 feet, and nearly covered with rich, green rainforest – the Virungas”. Situated in the far northwest of Rwanda, the Parc des Volcans protects the steep slopes of this magnificent mountain range – home of the rare mountain gorilla – and the rich mosaic of montane ecosystems, which embrace evergreen and bamboo forest, open grassland, swamp and heath. An exhilarating trek through the cultivated foothills of the Virungas offers stirring views in all directions. Then, abruptly, the trail enters the national park, immersing trekkers in the mysterious intimacy of the rainforest, alive with the calls of colourful birds and chattering of the rare golden monkey, and littered with fresh spoor of the mountain’s elusive populations of buffalo and elephant. Through gaps in the forest canopy, the magnificent peaks are glimpsed, easily accessible and among the highest in Africa, beckoning an ascent. The bustling market town of Ruhengeri has a memorable setting at the base of the Virungas. On the outskirts of town, the natural bridge at Musanze – a solidified lava flow – is a fascinating relic of the volcanic activity that shaped this scenic area. Also within easy day tripping distance of Ruhengeri are the seldom visited but lovely Lakes Burera, Ruhondo and Karago. Ruhengeri offers a good selection of reasonably priced small hotels and guest houses, including the newly renovated hotel Gorilla’s Nest. Visitors could also base themselves in Gisenyi or Kigali and – with an early start – head to the Parc des Volcans and Ruhengeri as a day trip. The Virungas are the last outpost of the endangered mountain gorilla, and their lush slopes provide an appropriately dramatic natural setting for what is perhaps the most poignant and thrilling wildlife experience to be had in Africa. Nothing can prepare the visitor for the impact of encountering a troop of gorillas munching bamboo in their unfenced natural habitat. The sheer physical presence of an adult male silverback – three times as bulky as the average man, yet remarkably peaceable and tolerant of human visitors – defies verbal description. Nor are there words to convey the thrill of recognition attached to staring deep into the liquid brown eyes of these gentle giants, who share some 97% of their genes with humans. That mountain gorillas survive today is largely thanks to Dian Fossey, who is buried at Karisoke, her research centre in the Virungas, alongside some of the animals to which she dedicated her life. Fossey became a household name following the release of the biographical film Gorillas in the Mist, which was set in the Parc National des Volcans, and shot on location there. Critical and public acclaim ensured that Gorillas in the Mist also served to raise international awareness of the plight of the mountain gorilla, whose numbers have increased from an all-time low of 250 in the 1970s to almost 400 in 2001. Roughly half of the world’s mountain gorillas are resident on the Rwandan slopes of the Virungas, where four habituated groups – ranging in size from seven to 37 individuals – can be visited by up to 32 tourists daily. A gorilla visit can entail anything from a 1 to 4-hour trek through the forest, led by experienced trackers who have spent their entire lives living in or close to the forest. Your trek will be enchanting as you weave through overhanging vines, moss-covered Hagenia trees and giant Lobelias that thrive in the tropical climate. You may spot golden monkeys or see buffalo, bush duiker and a wide variety of bird life. But the high point, of course, one of the greatest wildlife experiences on earth, will be spending an hour with the gentle giant gorillas as they go about their daily life, feeding, playing, resting, raising their young. At the end of your visit you will understand what kept conservationist Dian Fossey living in this same forest for 18 years protecting these wonderful animals. For a really unique experience, go out trekking for Golden Monkeys. Fully habituated now and only open for visitors since June 2003, enjoy a rare treat watching these unique primates play and perform in the forest.